If you are looking for the modern RuneScape guide for this content, please see our Shield of Arrav guide. Varrockian literature tells of a valuable shield, stolen long ago from the Museum of Varrock, by a gang of professional thieves. See if you can track down this shield and return it to the Museum. You will need a friend to help you complete this quest. 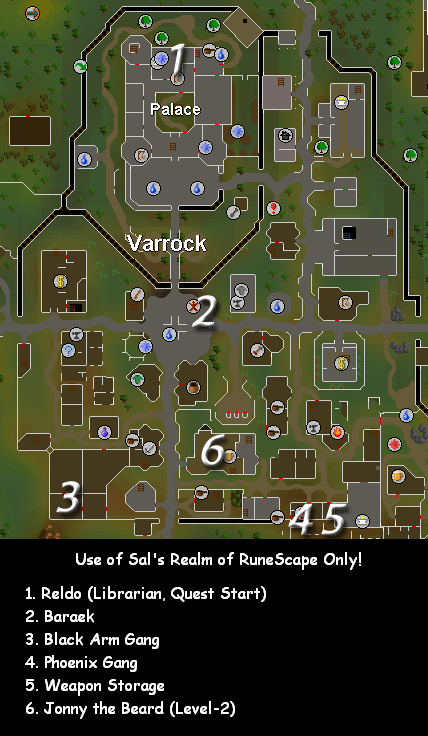 By speaking to Reldo, the librarian of Varrock Castle or Charlie the Tramp, located next to the Varrock Weapon Store. Before starting this quest, you are going to need a friend to help you who has not started this quest yet. Speak to Reldo, located in the Varrock Castle library, north from the entrance of the castle. Ask him for a quest. After a short conversation, he mentions a book in the nearby shelves that may tell you about a quest. This book can be seen near a blue and white shield on the top shelf of the bookcase, facing away from the desk. After you have read this book, talk to Reldo and he tells you to talk to Baraek, who is located outside of Varrock Castle. Now that both of you have started the quest, decide on the gang that each of you will join. Apparently the shield was broken in half, and each gang has one piece. You'll each have to join a different gang to get both halves. Baraek can be found outside Varrock Castle in the marketplace, near the fur stall. Ask him about the gang, but before he gives out the location, he wants 20gp. After he tells you about the location of the gang, head along the south wall, walking east until you see a small building with a dungeon symbol ( ). Climb down the ladder and talk to Straven. Tell him that you know who they are, and that you would like to offer your services. He wants you to get an Intelligence Report from Johnny the Beard, located inside the Blue Moon Inn. After killing him, you should receive an 'Intel report'. Bring that back to Straven and then he will allow you to be in the Phoenix Gang. He will give you a key in return, in which you will gain access to both the Phoenix Gang Hideout and a weapon storage place. Enter the hideout and head southwest until you see a chest. Open and search it and you will receive a left-half shield. As soon as you get the left-half shield, climb the ladder and walk over to the building east of the hideout. Open the door and climb the ladder to approach a weapon storage building. Inside there is a Weaponmaster who is Level 23 and guards the Phoenix Crossbows. Kill the Weaponmaster and take two Phoenix crossbows on the floor. Give these to your friend in the Black Arm Gang. After you have spoken to Reldo, talk to Charlie the Tramp and ask about the alley behind him. He says that the Black Arm Gang can be found there, and ask if they would let you join. Talk to Katrine, who is inside the building and tell her that you've heard that they are the Black Arm Gang. Ask her if you can become part of the gang, and asks you to steal two Phoenix Crossbows. Make sure your friend has traded you two Phoenix Crossbows. Give Katrine the crossbows and she will make you a member of the gang. Go upstairs to the Black Arm Gang Hideout and search the cupboard on the east wall for a right-half shield. Once each of you have half a shield make your way to the Museum, north from Varrock East Bank. Talk to the curator. You will receive either two left half certificates, or two right half certificates. Which certificate you get depends on which gang you're in. Find your partner, and trade them exchanging one of the certificates, so that you both have a left half and a right half certificate. Use one half with the other to get a full Certificate, and then talk to King Roald in Varrock Castle to redeem your reward.